Can't get your little ones to eat their lunches? Your Children are Picky Eaters and you don't know how to deal with it? With GO FRESH Little Foodies Sandwich & Veggie Cutters lunchtimes will become an exciting fun journey for your children! The old parental issue of "How to get my children to eat their lunch?" will be now resolved. A set of 5 funny shaped sandwich cutters together with 5 fruit cutters and bonus bento decorations will make your kids ASKING you to prepare them a meal! Our sandwich and vegetable shapes can be used for funny sandwiches and toasties, different fruit and vegetable shapes, chocolate shapes, cakes, cookies and biscuits. Moreover, it is a great tool in preparing for Kids Showers, Kids Birthday Parties and any other occasions! 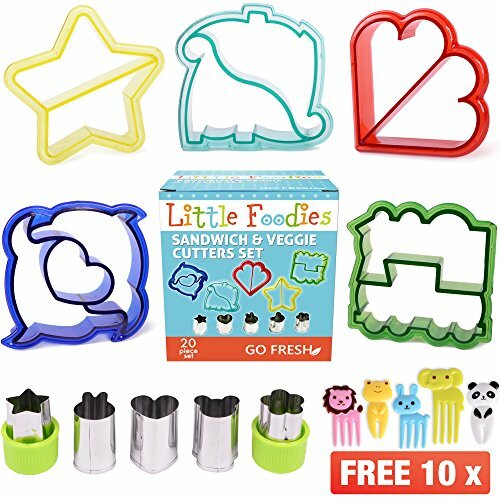 GO FRESH Little Foodies Sandwich Cutters for kids are simple and easy to use - just press onto sandwich or fruits! Moreover, sandwich shapes have no sharp edges, so can be easily used by children. The set components are made of food safe plastic and stainless steel, and are completely dishwasher safe. So, let your kids have FUN while eating their meals! ✮ Loved by Kids ✮ - Can't get your little ones to eat their lunches? --- With our GO FRESH Little Foodies sandwich cutters set you will bring FUN and JOY to food preparation and lunching time. Combination of funny sandwich and vegetable cutters together with cute animal bento decorations will make your picky eaters ASKING to prepare them a Meal! ✮ All-Inclusive Cooking Tool ✮ - The most popular Shapes in 1 Set: 5 Sandwich Cutters - Dinosaur, Star, Heart, Train, Dolphin; 5 Fruit Cutters - Star, Heart, Flower, Rabbit, Mouse; BONUS 10 Bento Deco - Elephant, Panda, Rabbit, Lion, Giraffe. ✮ Safe & Durable ✮ - Our sandwich cutters for kids are made of Food Grade Plastic, are BPA free, Dishwasher Safe, with no sharp edges, designed to be extremely durable and safe for children. ✮ Great Gift ✮ - Each Little Foodies set goes in colorful and sturdy box which makes it an ideal gift for any kids occasion. One set for all decoration needs. Just free up your kids' imagination! If you have any questions about this product by GO FRESH, contact us by completing and submitting the form below. If you are looking for a specif part number, please include it with your message.